The route begins in the parking lot at the entrance of Beget. 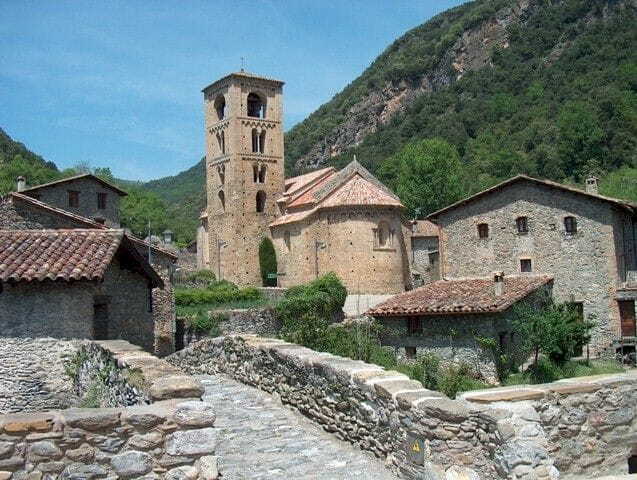 Before starting the hike, the church of “Sant Cristòfol” and its majesty from the twelfth century are worth a visit. From the R78 sign Sant Cristòfol de Beget you must head towards the village crossing the bridge over the river and climb the steep Josep Duñach street where at its end, just outside the village you will see the R79 sign Camí de Can Reguer. Head towards the “Coll de Malrem” pass through the GR83 that follows the old path, used for hundreds of years, to communicate Beget with the neighbouring French town of Menera in the Vallespir county. This path, known as the smugglers route, climbs rapidly to the rocky “Del Grau” pass offering breathtaking views over Beget and the mountains of the upper Garrotxa. You will arrive at the chapel of “Sant Antoni de França” located at the “Coll Golofreu”, an open area of pasture fields. You must cross a track and follow a path to the fields of Bocabartella. In a few minutes a pathway going uphill will lead you to the Coll de Malrem hilltop, R83 sign, from where you can enjoy a curious view of the Comanegra peak and “Torres de Cabrenys” already in the Vallespir French county. Leave the GR83 marks to follow the white and green marks, first along the ridge and then descending gently to the Bocabartella pass. A few meters below you can see the farmhouse that names this path. While going downhill through a rocky path you can see the Rocabruna castle perched on a hilltop just in front of you. The path ends up in a field where you will see some old quarries. At this point, pay attention and keep walking straight to find another path that, through a narrow pass between rocks, will lead you to the Rocabruna's road. To avoid a stretch of the main road you can follow the old path that you will find on the right side of a ruined house. After rejoining the road you will arrive at the R80 sign Can Tadeu. From here, you can visit Rocabruna and its Romanesque church within minutes. From the R80 sign continue the route following the white and yellow marks that will lead you to the Rocabruna castle, standing right in front of you on a hilltop. This castle, documented in the eleventh century, played an important role during the “Remences” (a Catalan name for those who were serfs) revol tin the fifteenth century. Leave the castle following a little path going around the hill which will take you to the Rocabruna stream. Follow the stream on its way down until arriving at the Molí d'en Sorolla, sign R76. Continue following the GR11 path parallel to the stream towards Beget running between oak trees. As you go forward the valley and the views to the mountains of the upper Garrotxa widens. After crossing the road the path follows the stream of Beget taking you to waterfalls and pools. The path gets shady and rather narrow while running parallel to the road. After crossing twice the main road the path rapidly descends to Beget, right were you started this circular route.